Quirky Jessi: Tic Tac Toast - Play right on your bread! 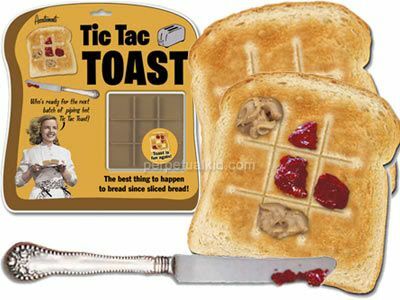 Tic Tac Toast - Play right on your bread! One of the simplest games of all time is Tic Tac Toe, so of course I'd include a quirky version of the old game. We've established that I love playing with my food, so Tic Tac Toast is perfect, hehe. Really, it's just a little plastic stamper that you press into the bread and once toasted, it "brands" a grid onto it. I'm sure you could handle doing this yourself with a knife, but that takes the fun out of giving this as a gift. That is too funny! I want one!